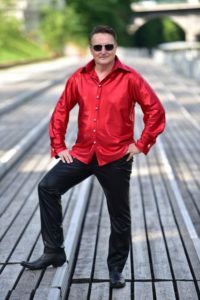 The band Sam’s Fever was established in 2012 on the 35th anniversary of Elvis Presley’s death in order to recreate music of the king of rock ’n’ roll himself through our own original interpretations. Every year the European Elvis Festival is held in a small town of Bad Nauheim near Frankfurt where Elvis lived during 1958 and 1960 while in military service. In 2015, at the 14th festival, the first competition of Elvis’ music interprets took place and Sam’s Fever made it to top 10. On 15th August they wowed the audience and expert jury and won. We became the best interprets of Elvis’ music in Europe and took the victory home to Slovenia. One day later we played as a supporting band to TCB Band and shared the stage with Elvis’ musicians (James Burton, Glen D. Hardin and Ronnie Tutt), who played alongside Elvis from 1969 to his death in 1977. In 2015 we recorded our debut ‘About the King’ and presented it to the audience in December 2015 at the gala concert. On TCB cruise in May 2016 we joined forces with Elvis’ musicians and enriched the musical program. Among the crowd was also Priscilla Presely, Elvis’ ex-wife, who we later met in person. In 2016 the band Sam’s Fever became a registered trade mark.